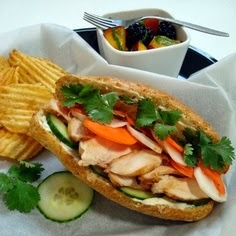 Banh Mi is actually a term for Vietnamese Baguette This is actually a combination of rice flour and wheat. Banh Mi is usually stuffed with marinated pork and chicken, some pickled veggies like cucumbers, radish, onions and some herbs. I used to buy this before for VND20,000 or $1 and believe me it's so filling! I love the aroma and the flavours of all the fillings. Super yummy! I actually love most of the Vietnamese dishes especially their "pho" and Vietnamese spring rolls and one good thing about the Vietnamese foods is that, the price is really affordable.